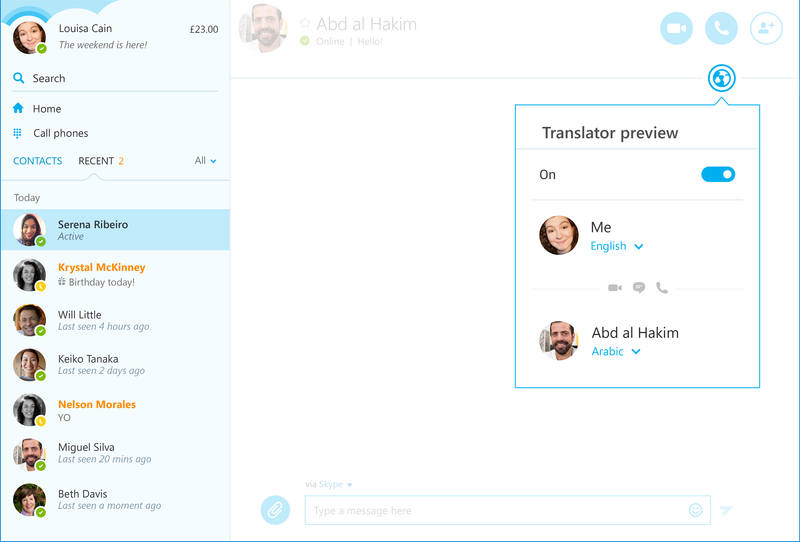 Microsoft’s Skype introduced launched its real-time translation feature out of beta about half a year ago and today it is adding Arabic — and more specifically, Modern Standard Arabic — as its eighth supported language. As the Skype team told a small group of reporters at a press event in its Palo Alto offices last month, the company decided to add Arabic in part because it wanted to help refugees communicate. As the team argued a number of times during the event, Microsoft wants Skype to be part “of society’s fabric” — and that also means responding to what’s happening in the world today. During last month’s demo, the translation to and from Arabic wasn’t always perfect — something the team acknowledged. Skype, however, decided that the machine learning algorithms at the core of the translation service were at a point where the failure rate was acceptable. To speed up the process of bringing Arabic support to market, Skype actually worked with a team on the ground in Egypt to collect the data and train its models over the last couple of months. In addition to Arabic, the Skype translator now supports English, Spanish, French, German, Chinese (Mandarin), Italian, and Portuguese (Brazilian).